And Jesus traveled in all Galilee, teaching in their synagogues, proclaiming the Good News of the Kingdom, and healing every disease and every sickness among the people. And the report about him went out into all Syria, and they brought to him all who were sick, afflicted with various diseases and illnesses, possessed with demons, epileptics, and paralytics; and he healed them all. Large crowds from Galilee, Decapolis, Jerusalem, Judea, and from beyond the Jordan followed him. Matthew 4:23-25 NHEB. Previous Bible Study Lesson: Jesus Healing #6.10. 1) Why was the healing of Peter's mother-in-law so important to us? 2) What was so odd about the healing of the man with edema? 3) Did Jesus ever heal himself? Thanks for coming by and studying with us. Our previous lesson focused on the physically handicapped people that Jesus healed. This lesson will deal more closely with the sick and diseased people that Jesus cured. We're going to study several representative instances of various maladies that Jesus addressed with his powerful healing miracles. Jesus healed all types of diseases and sicknesses; and he healed all types of people: male and female, young and old, good and bad. Are you ready to follow Jesus like the crowds who watched him perform miracles? Let's begin by turning our attention to a woman who had a debilitating disease for years. Jesus was pushing through his large admiring crowd, when a sick woman attempted to make a way to him. She had been sick for 12 years with constant bleeding. Doctors had tried various procedures, but only made the matter worse. She ran out of money while seeking a cure, finally losing all hope. She heard about Jesus healing the sick and other miracles being performed in her area, so she went out to find him. She saw the large crowd, saw Jesus, and made her way to him. She was thinking, "If I can just touch his robe, I will be healed." The bleeding woman finally got close enough to touch his robe. Immediately, she felt a powerful sensation of healing gently and warmly electrify her body. The woman's bleeding stopped. The terrible disease had been cured! Her excruciating suffering had ended! She was so happy. Jesus stopped in his tracks, because he felt healing power exit his body. He demanded to know, "Who touched my robe?" 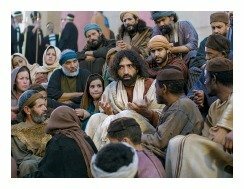 The disciples chuckled because of the huge crowd, and asked, "How can you ask such a thing?" 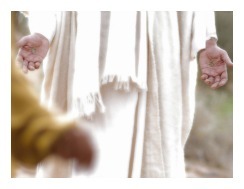 Jesus kept looking; wanting to know who the person was that touched him. Finally, the (formerly) bleeding woman fell at his feet to confess. She was shaking, frightened from the amazing healing miracle that happened to her. She told Jesus exactly what she did and testified to everyone that she was instantly cured (Luke 8:47). Jesus smiled and said to her, "Daughter, your faith has made you well. Go in peace. Your suffering is over." (Mark 6:34). This is such a beautiful moment in Jesus' ministry. There are several lessons to learn from this occurrence of Jesus healing the sick woman. First of all, the woman sought out Jesus. She got off her chair and left her house, even though sick and shamed by the bleeding. She found the Son of God. We're all called to desire healing, both physical and spiritual. We're all called to seek Jesus, because he is the ONLY One who is the Great Physician. The (formerly) bleeding woman sought Jesus with faith. She hoped in him. She trusted him. After all else failed, and all other attempts and people failed to cure her, she looked to Jesus. Her hope in people and worldly cures had evaporated. She learned helplessness - the great, GREAT lesson of learned helplessness. She finally realized the ONLY One who could help her was the One who especially created her. Jesus didn't know initially that the woman was seeking him, nor did he know who was healed after the fact. No one did, but... God the Father, who's healing Spirit worked through Jesus without Jesus being cognizant of the woman. That's amazing, really. This is a special case of a healing miracle being revealed as the great work of the Trinity. You may think the Father is too busy running the universe to heal some sick woman. You could think the Spirit is too busy saving people and sanctifying the saints. You may object to this teaching because Jesus KNOWS everything. In response to this accusation, Jesus in fact, gave up certain elements of divinity when he came to earth (Philippians 2:6-7), and one of those elements was his universal omniscience. In response to the latter, both God and his Spirit are never too busy to help one of their chosen ones - they are always working around us (John 5:17). The final point taken from this beautiful encounter is this: All miracles are God's miracles. This healing miracle of Jesus proves it. This miracle tells us God is powerful enough to heal physical diseases, therefore, he is strong enough to heal the heart of a sinner. Jesus heals Peter's mother-in-law: (Matthew 8:14-17; Mark 1:29-31; Luke 4:38-39). Jesus, James, and John left the synagogue and went to Andrew and Simon Peter's house. The people there begged him to heal Peter's mother-in-law, who fell ill with a severe fever. This sickness may seem petty and insignificant to some; but, in reality, it speaks volumes to the compassion of God. Jesus took Peter's mother-in-law by her hand and rebuked the fever. As things in nature always do, the fever in this case, departed the woman upon Jesus' command. Jesus speaks and it happens. Nothing is such a "small deal" that Jesus won't address it. Even a simple fever was healed by the Lord. Peter's mother-in-law was perfectly healed by Jesus Christ; and the Bible tells us she immediately got up and made a meal for everyone. All of God's miracles are instantaneous and complete. He created all things perfectly; and those times he chooses to heal, all things are perfectly cured. Jesus healing the sick, in this case a simple fever, reveals his compassion for even the smallest of diseases. 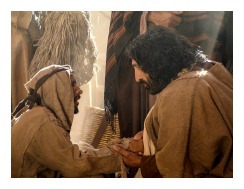 Jesus heals the nobleman's son: (John 4:46-54). We've seen God heal two women, and now we learn that he also healed a young boy. Jesus was walking through Galilee one day, specifically in the town of Cana. Jesus' first miracle was in the same town. 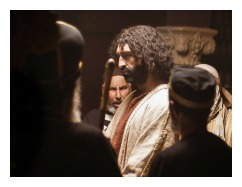 A government official, aka nobleman, from the nearby town of Capernaum heard about Jesus healing the sick. The nobleman had a very sick son, so sick, in fact, that he was about to die. This was serious and the man was running out of options and time. He left Capernaum to go and seek out Christ the healer. The man found Jesus in Cana. Hope filled his heart. He literally begged Jesus to come and heal his son before the sickness was fatal. Jesus stopped and asked the government official, "Will you never believe in me unless you see miraculous signs and wonders?" Jesus wasn't so much frustrated with this particular man as he was with the constant barrage of people coming to be healed or seeking other miracles. He occasionally grew tired like normal overworked people! The man didn't verbally respond to Christ's question because of his urgency. He needed help right now, and there was no time to chat, he thought. The man passionately begged Jesus, "Lord, please come now before my little boy dies." Jesus was okay with that response - no problem. The man properly called Jesus "Lord," which was no small thing. He revealed his faith in Jesus by the title he used. It reminds us of the Bible text that says, "No one can call Jesus Christ 'Lord,' but by the power of the Holy Spirit" (1 Corinthians 12:3). Jesus surprises us here, because he didn't follow the man to Capernaum. He simply smiled and said, "Go back home now. Your son will live!" The man totally believed Jesus as he turned and headed home faithfully expecting the miracle. Capernaum was a good walk from Cana; and the next day while the nobleman was still walking, a group of his servants met him with some great news! His son was alive and well! He was completely recovered from his sickness. They celebrated. The man asked them what time the boy was cured and they responded, "Yesterday afternoon at one o'clock his fever suddenly disappeared!" That news was no surprise to the man, because he knew that was exactly the time Jesus told him, "Your son will live." Not only did the sweet little boy live, but he became perfectly well. This healing miracle lesson reveals several terrific principles to us. First of all, Jesus doesn't have to touch a person, or even be present, in order to heal him or her. Jesus, by God's power, can heal with a voice command or even a thought command, and it happens instantly. The final and most critical point to note is that the family of the little boy all came to believe in Jesus that day. Jesus healing the sick boy is yet another miracle that led to the salvation of those who witnessed the amazing feat. Our belief in Christ's miracles recorded in the Bible should result in salvation, as well. Jesus cures a man with dropsy: (Luke 14:1-6). Luke records the actual event of Jesus healing the sick man on the Sabbath. Jesus was invited to a Pharisee's house for dinner and there were a few other religious leaders dining with them. At one point, Jesus noticed a man with swollen arms and legs, which was probably a case of dropsy. Dropsy is an ancient term better known today as edema, which is a build-up of fluids in one's arms and legs. Jesus thought this was a perfect opportunity for a teaching moment. He asked the religious leaders, "Is it permitted in the law to heal people on the Sabbath day, or not?" The religious leaders refrained from answering, because they knew by now that Jesus would make them look foolish. Jesus healed the sick man by touching him and then sent him away perfectly cured of dropsy. The man with dropsy was in the right place at the right time. He was very fortunate to be used as a teaching illustration. The religious leaders were befuddled at this, so much so, that they couldn't answer Jesus when he asked, "Which of you doesn't work on the Sabbath? If your son or your cow falls into a pit, don't you rush to get him out?" Jesus despised what the religious hypocrites did to the Sabbath Day. They took a day that was to be set aside for people to relax and reflect on God's goodness and creation, and they turned it into their strictest law code, in which a violation was punishable by death. They did this by building an entire, overbearing system which defiled the original intent of God's Sabbath Day law. The teaching that works of mercy are permitted on the Sabbath Day was the principle message behind Jesus healing the sick man with dropsy. In fact, works of mercy are ALWAYS permitted in God's Kingdom. Mercy always overrules man's laws. Fortunately, for the man with dropsy, timing was everything! He didn't ask for healing, his faith wasn't mentioned, nothing... nothing, but the sheer grace of God. Jesus heals the daughter of the non-Jewish, Syro-Phoenician woman: (Matthew 15:21-28; Mark 7:24-30). We have to give a young lady a spot in our lineup of those fortunate people who were healed by Jesus. We actually have an entire Bible study lesson on Jesus healing the sick girl (click): Jesus and the Canaanite Woman. We can summarize the amazing miracle here. The reason this healing miracle is so powerful is because the woman really had to earn the right to have the demon cast out of her daughter. She was a Gentile, so Jesus had to tell her, "I was sent only to help God's lost sheep - the people of Israel." She cried out, "Lord, help me!" Jesus broke the bad news to her, "It isn't right to take food from the children and throw it to the dogs." This meant that Jesus was feeding (teaching and healing) his chosen nation, i.e. children; but not the Gentiles, i.e. the dogs. The term "dogs" meant "sinners" in biblical days. The woman, though, because she addressed Jesus as "Lord," along with her persistence, found favor with Jesus. Then she added this absolutely remarkable insight, "That's true, Lord, but even the dogs are allowed to eat the scraps that fall beneath their master's table." This maybe the wittiest retort in all of Scripture. The brilliant response grabbed Jesus' attention. He emphatically said, "Dear woman, your faith is great! Your request is granted." The Canaanite woman's young daughter was instantly and perfectly healed of demon possession. The love of a mother is great, and the love of God is magnificent. The daughter was a blessed girl, indeed. We can learn from this lesson that faith leaves a big impression on Jesus. He is so very impressed when a person expresses faith in creative and astounding ways. Jesus healing the sick girl tells us all to use our faith persistently and practically despite appearances and preconceived thoughts. Jesus hears, Jesus heals. We also learned here that Jesus doesn't only heal Jews, but also Gentiles. He doesn't only heal men, or women, or males only, but also young girls. He showed no inequality or inconsistencies with those who he healed. Fruit of the Spirit Response to Jesus Healing the Sick. Here is a question for you: Did Jesus heal himself? Many people with a godless attitude tell Jesus to prove himself. He isn't totally opposed to proving his authority, but, he generally didn't put up with this nonsense. He expects people to believe his word; and if they don't, generally, they're out of luck. Jesus even predicted that people would make such thoughtless demands, "You will undoubtedly quote me this proverb, "Physician, heal yourself." Onlookers of his crucifixion did scoff at him, "He saved others, let him save himself!" Others mocked Jesus, too, "If you are the King of the Jews, save yourself." Even one of the criminals hanging beside him joined in, "So you're the Messiah, are you? Prove it by saving yourself - and us, too, while you're at it!" Jesus was on the cross for a reason - that was to die for you and me (John 3:16). Saving himself, which he could have done, would have violated the Father's will and plan of redemption. Plus, he would have left us in a hopeless state of despair as we await our judgment and eternal damnation. But, thankfully, Jesus died for us and rose because God accepted his sacrifice. Because Jesus lives, we can live forever. Praise God. The risen Jesus actually left the puncture wounds of the nails and spear after he was glorified. Why would he do such a thing? Jesus left his wounds for those people who doubt, like the disciple Thomas. The risen Jesus left those wounds, so that all people who doubt can read the story and believe. There is no need to prove himself any longer - it's recorded in God's word (John 20:24-29). You must believe God's word, by FAITH, and you'll be healed by Jesus. Are you ready for Jesus healing? Sinners Prayer. 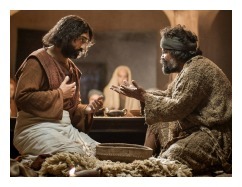 Next Bible study lesson: Jesus Heals the Blind #6.12. 1) What does the fact that those whom Jesus healed were immediately and completely healed? 2) Addressing Jesus properly makes a difference in the results (compare Mark 7:24-30 with 10:17-22). Discuss the titles used to address Jesus. 3) Why is the fact that Jesus heals both small and great diseases so important to us? Therefore, lift up the hands that hang down and the feeble knees, and make straight paths for your feet, so that which is lame may not be dislocated, but rather be healed. Hebrews 12:12-13 NHEB. Is any among you suffering? Let him pray. Is any cheerful? Let him sing praises. Is any among you sick? Let him call for the elders of the church, and let them pray over him, anointing him with oil in the name of the Lord, and the prayer of faith will heal him who is sick, and the Lord will raise him up. If he has committed sins, he will be forgiven. Therefore confess your sins to one another, and pray for one another, that you may be healed. The insistent prayer of the righteous is powerfully effective. James 5:13-16 NHEB. Dear Heavenly Father. You love us so much. Thank you for the compassion and care that you show us. Sometimes, Lord, it seems like you're not there when we're hurting, but, by faith, through trusting in you, we know you are close. Keep us strong through trials, keep us from temptations, protect us from evil. O God, don't ever leave us or forsake us. Lord, we long for the day, that glorious day, when all our diseases, injuries, pains, and sin are gone forever. Thank you for healing us by the Blood of the Lamb. In Christ's holy name, Amen. Share on Facebook below and click for your Free Printable Bible Study Lesson: Jesus Healing the Sick. Click to download your free printable List of Bible Miracles; and List of the Miracles of Jesus. Special Note: I'm grateful to Big Book Media & Free Bible Images, stock.xchng, Morgue Files, and Stock Photos For Free for the use of their photos for the Jesus Healing the Sick Bible Study Lesson.